This neat little module reacts when being shot by a 38kHz laser tag gun. It can also be tested with any TV remote control that is rated for 38kHz. It supports 12x different audio sound bytes in four separate categories. There are three bullet ricochet sound bytes, three zombie sound bytes, three video games sound bytes, and three comical scream sound bytes. This unit can be fitted behind a target, and when an infrared signal from a laser tag gun reaches the receiver, a sound byte will be sent to the Audio output, which can be fed into your own stereo system through the included stereo-stereo connector. This will allow for you to significantly up the volume! There are four different modes of operation that are selected through jumper placement and the on board button. The above video acts as a full user manual. This unit is extremely easy to use, and is ready to be used right out of the box! You can use a 5mm wall adapter rated for 8-12VDC, or you can use the blue terminal box to apply power. 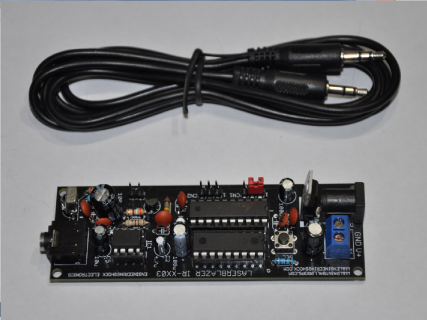 Simply connect your positive supply voltage to the "V+" terminal (8-12VDC), and your negative supply pin to the "GND" terminal. You can also purchase an appropriate AC adapter from us. Simply send us an inquiry about this! 4) You can choose to select and replay a category of sound bytes over and over (Ricochet/Zombie/Video Game/Scream). Simply watch the above video for user instructions! This unit was designed with both a battery option, and a wall adapter power option. It requires 8-12VDC to operate. The above video acts as a full user manual. You can purchase an appropriate wall adapter or 9v battery connector separately. Just send us an inquiry, and we will custom invoice you. This unit is one of four new Laser-Tag specific products called "LaserBlazer". Check out our store for more Laser Tag specific props! 1x fully assembled and tested IR-XX03 Sound Effects Target Practice Module (GREEN PCB - NOT BLACK). If you wish to purchase an AC adapter, you can simply inquire for a custom quote. 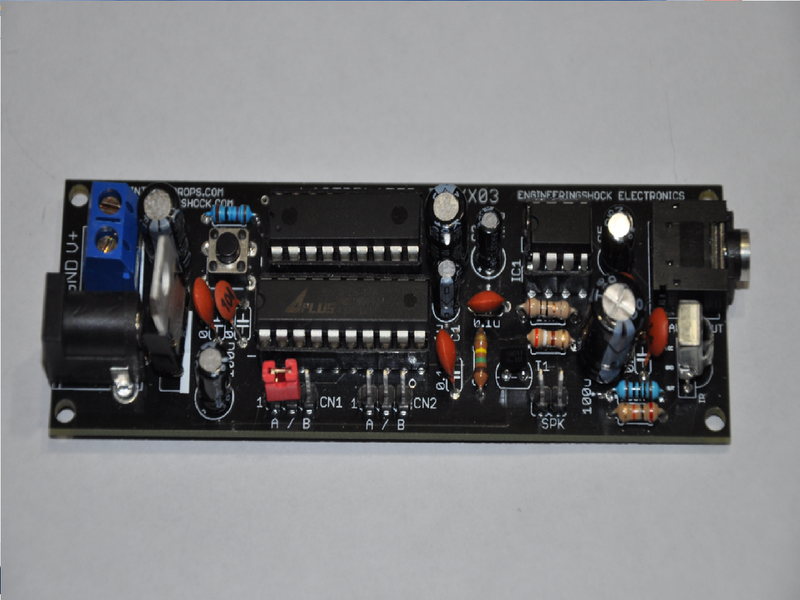 We sell 9v 1A wall adapters for an additional $7, and a battery connector which can be soldered to the board for you for an additional $2. Just ask! 1x Stereo-Stereo cable for interface with your audio amplifier. What if this unit doesn't work with my Laser Tag guns? It should work and learn your gun signals with no issue as long as your laser tag guns are rated for 38kHz, and not 56kHz. If your laser tag guns are rated for 56kHz, simply send us a question. We can modify this unit to work with 56kHz laser tag guns. If after watching the above video and reading the above information you still have questions, simply send us an inquiry, and we will get back to you promptly!